RIO DE JANEIRO – This weekend Sérgio Cabral, the governor of Rio, asked the public to join a protest march set for Wednesday, March 17th, against the so-called Ibsen amendment that will see Rio state lose out on an estimated R$7 billion per year. 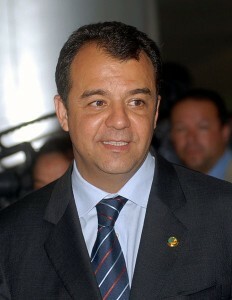 Rio de Janeiro state governor, Sérgio Cabral, photo by Wilson Dias/ABr/Wikimedia Creative Commons License. Pamphleteers were out in force on Rio’s beaches, distributing pamphlets to the sun-soaked public emblazoned with the simple message, ‘Against cowardice – in defense of Rio’. Light aircraft streamed banners bearing the same message. This week at Maracaná, the teams will be supporting the call to arms with placards exhibiting the slogan, and even the infamous O Cristo Redentor (Christ the Redeemer statue overlooking Rio) has been decorated with a huge banner defending the cause. The action follows this week’s decision by the Chamber of Deputies to approve the amendment proposed by Ibsen Pinheiro to alter the law so that royalties arising from the exploration of oil are distributed amongst all of Brazil’s 27 states, instead of just to the state and cities in which the oil is mined, as the law currently stands. According to the ANP (the Agência Nacional de Petróleo), Rio boasts 80.7 percent of the country’s known reserves and derives much of its income from oil production. The proposed amendment, while benefiting many of the other states, would mean a huge blow to Rio’s economy according to figures released by the state government. Not only will it lose out on future income from the enormous sub-salt reserves discovered in 2007 but it will also affect royalties from reserves already in production. This is the latest in a history of perceived political injustices towards the state. The 1988 constitution saw Rio lose out heavily on tax-derived income when oil products were exempt from the general rule that taxes levied on all products are due to the state of origin of those products. It was agreed that taxes from oil-derived products would be paid to the state in which they are refined and distributed instead. If these latest amendments are approved Rio looks set to lose out for a second time. 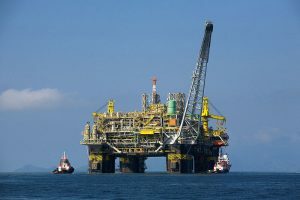 The debate over oil royalties heats up in Rio, photo by Divulgação Petrobras/ABr/Creative Commons License. According to the official state government website, if the new scheme goes ahead the money that will be lost will be more than the total amount invested by the state government in the last year. Cabral appeared at a public event this week after it was announced that the first round of decision-making had been lost. He claims that without this money the World Cup and the Olympic Games projects face uncertainty. Rio received more than R$4 billion in royalties and benefits in 2009, but under the new law it would receive just R$100 million per year which would directly impact spending on essential services such as health, security, education and the environment, as well as public works. The governor is outraged, denouncing the Ibsen amendment as “the biggest massacre in the country’s federal history”. A protest march has been arranged for 4PM this Wednesday, March 17th. It will begin at the Candelária, proceeding up Avenida Rio Branco and conclude at Cinelândia where there will be a public forum headed by Cabral. The propaganda reads, “We will defend our riches… Alert your family, mobilize your friends… against cowardice, in defense of Rio de Janeiro!” The message is clear: the governor will not give up without a fight. It’s not Rio’s oil, it’s Brazil’s oil. If Rio wants the oil, they should separate from the rest of the country and give back to Brazil the infra-structure and dig their own little holes to find their own oil. If this theft is allowed to become law, it will be time for the people of Rio de Janeiro to ask whether their interests continue to be served by remaining within Brazil, or would they be better off as an independant Nation — not Estado do Rio de Janeiro, but rather Republica do Rio de Janeiro. Rio has been treated by the the rest of Brazil as a pocket for picking, which has led to its steady decline from which it is only now rising again. Rio can remain in Brazil, and send its wealth to the other states which have done absolutely nothing to earn it, to spend on corruption. Rio will have as much oil as Kuwait, and need not stand for such indignities. Rio can be pushed only so far before such alternatives are considered. What people of Brazil insists to ignore is that Royalties is a compensation to all the damage made to nature by the oil rigs/platforms and its extraction. Its money is a fair compensation to be used for nature recovery in natural disasters, development of industrial cities which economies run around oil companies and refineries, etc. Brazilian people seem to ignore that Royalties are also due to Energy and Mining, and Rio de Janeiro has no part in the Royalties payed to states like Para (whose economy rely on its Mines). Yes, the Oil is a property of the Brazilian Government, but Royalties must be paid to the states where the oil is mined. It is not only fair, but its the right thing to do. michelle , you really are shortsighted. C’mon folks. The benefits that may come from this oil belongs the the entire country. To say otherwise is to be not only selfish but short-sighted. If the politicians in Rio calculated these revenues when pitching the World Cup and Olympic hosting — that was their grave (and naive) error. All of Brazil deserves to be uplifted from these national resources. How selfish can people be!!? !